recipient: Governors of the U.S.
President Trump has announced that he will withdraw the United States from the Paris Climate Agreement to reduce greenhouse gas pollution and keep global warming within 2 degrees of current temperatures. This is completely unacceptable. If Trump gets his way, our economy will forfeit any meaningful role in the developing clean energy field and U.S. goods would be hit with higher tariffs when exported. All while guaranteeing our communities will be hammered by rising seas, stronger storms, droughts, deluges and forest fires. State and local leaders are opposing Trump's horrible decision. The governors of California, New York, and Washington announced the formation of the U.S. Climate Alliance to fulfill the Paris Climate Agreement and reduce emissions. Washington Governor Jay Inslee stated: "Today’s announcement by the president leaves the full responsibility of climate action on states and cities throughout our nation. While the president’s actions are a shameful rebuke to the work needed to protect our planet for our children and grandchildren, states have been and will continue to step up.” . We need governors across the country to follow the lead of these governors and join the U.S. Climate Allance and commit to implementing Paris no matter what foolishness is coming from the White House. 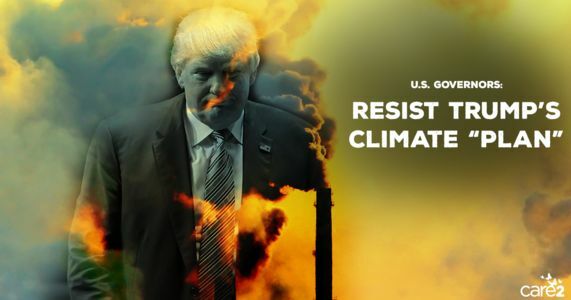 Please sign this petition and we will send an email to your governor urging them to stand up for global action on climate change – despite President Trump's irresponsible decision. A 3,000 square mile iceberg just broke off Antarctica! Meanwhile, scientists say the globe is heating up 2x as fast as we thought. Share the petition and urge your Gov to do what Trump won't: act on climate! Read the new NY Magazine article here. Warning: the worst-case scenarios are terrifying. Governors of 13 states are telling President Trump that #IAmStillIn for action on climate change. Share the petition to urge more governors to join the alliance. Tweet @YourGovernor, too!